Gyógyíthatatlan beteg hozzátartozóink méltósággal teli elkísérése és elengedése nehéz, de felemelő feladat. A Debreceni Hospice Ház Alapítvány azért tevékenykedik, hogy a búcsú napjaiban/pillanataiban senki se érezze magát egyedül. Az emberi méltóság mindannyiunk alanyi joga. Tegyünk érte együtt! Méltóság Napja - 2018. nov. 08. The Hospice has been established! With a yellow narcissus as our symbol we have been working with professionals, volunteers and our partners for years to foster awareness of the essence of hospice and palliative care – to be there for the dying and to comfort them during the dignified process of letting go. The most important achievement of our work over the last ten years has been the setting up of an in-patient ward and making a home-nursing service available. Our plans for the future include supporting the hospice activity in Debrecen, organising training for volunteers and others, arranging domestic and international conferences as well as launching charity programmes. 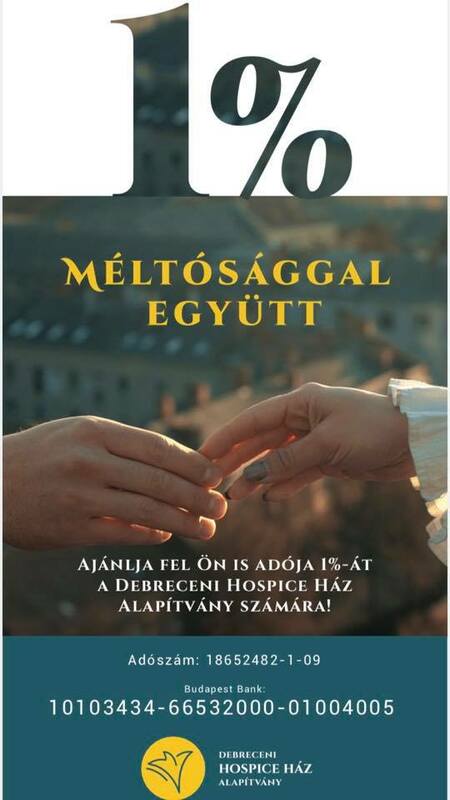 After several years of preparatory work the Debrecen Hospice House Foundation was established in the spring of 2015. Would you like to know what the work of the Hospice’s volunteers includes? The aim of the project called the “Meadow of Dignity” is to change attitudes and stress that life is precious until the very last moment. Become a supporting partner in a project that promotes respect for human dignity in the whole of society.